Pretty self-explanatory. I bought it from someone on eBay for $190 which was a steal in my eyes, and it was listed as new. It is also a NAS drive, so I'm not sure if that has anything to do with Windows recognizing it because I've never used one before. I've doubled checked all the cables and tried different SATA headers on my motherboard to no avail. I also checked to see if the drive was spinning by taking it out of the HDD bay and feeling it vibrating, and if it was indeed vibrating it's extremely slight. Do you think this drive is dead or am I just screwing up somewhere without realizing it? Its possible the BIOS of motherboard doesn't recognise the drive given how new it is compared to motherboard. The drive itself is often found in the WD Easystore external drives. Was win 7 64bit version? Yes, it is 64-bit. The thing is, it's not an external drive. I'm not sure what you mean by WD Easystore External Drives. Is it a software? Derp. Edit: From reading your link I see now that it probably was a "shucked" drive. If it is then that definitely explains my issue. I'll have to find a SATA-Molex adapter and test it out to see if it fixes my problem since I have no idea where to get that tape that they specified in the post, at least not locally, and I don't want to wait a week for some to come in the mail. I taped over the third pin on the drive and it doesn't seem to have fixed anything. I used packing tape to just see if it would work, not as a permanent fix. BIOS still isn't recognizing it and neither is Windows. I don't know how to use UEFI to change the format of the drive so that it might be recognized. I haven't had any experience with this outside the post. if BIOS can't see drive, windows won't either as it relies on bios. Format of drive doesn't come into it at this stage. perhaps see if it works in any other PC? TLDR: If your white label doesn't show up in bios/partition manager cover the 1st-3rd pins nearest the sata connector with tape or remove the orange lead/3.3v side of your sata power connector or use a 4 pin molex to sata adapter to power the drives. Perhaps the drive is configured to Power Up In Standby? If so, then a tool such as HDAT2 can disable PUIS. In fact Linux can spin up such drives. That said, enabling PUIS should not make the drive invisible to BIOS. BTW, I suspect that your WD100EMAZ drive is a rebadged HGST helium model. If you wish to eliminate a hardware problem, I can assist you with some simple measurements. To this end I would need detailed photos of the component side of the HDD PCB. I managed to fix my problem simply by updating my BIOS. I guess the moderators can officially mark this one as solved. 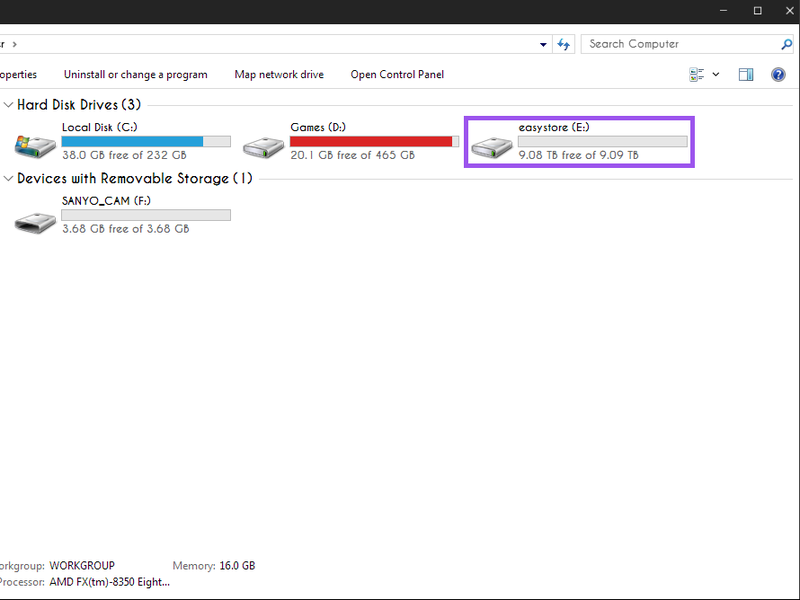 Although I do wonder why, even though it is supposedly a 10TB hard drive, why it only shows 9TB available. There is only one partition on it. And its only going to get worse as drive sizes expand. SSD makers using same figures which is just silly as ram makers do see 1024kb as a mb, unlike hdd makers. AIUI, a 250GB SSD typically has an actual NAND flash capacity of 256GiB. That's 275GB. The difference of 25GB is the overprovisioned space and is used principally for wear levelling. Error correction data is stored in the "spare area" of each NAND page. I assume that the overprovisioned space also contains the FTL (flash translation layer), but ICBW.